This is probably one of my most requested posts/videos. And it's finally here! I had a really hard time trying to narrow things down and decide what was absolutely necessary to pack. It turns out you have to bring A LOT more stuff than I had anticipated. I think I had watched too many American girls' videos on the subject...here in Ireland you need to bring a ton more! Especially when it comes to baby...so that will be a separate post as I have packed a different bag for Emilia. Let me know if you want to see what I packed for her! 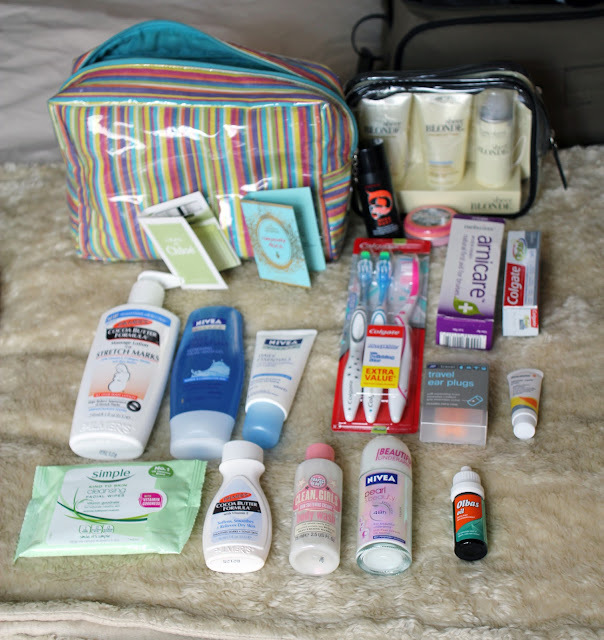 Here's what I packed for myself. The bag I'm using is just a small carry-on sized suitcase, and it's not very pretty or interesting I'm afraid...unlike Emilia's cute one! 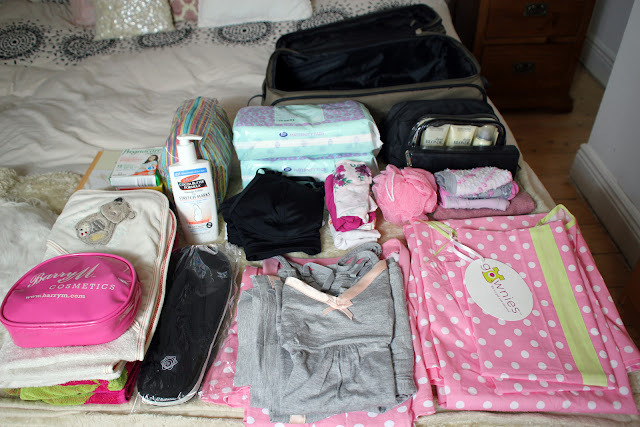 The list I used to help me figure out what to pack was from my hospital's magazine (CUMH) but I also found this downloadable one from MummyPages very helpful! Here is my list! Will Jofus be taking a bag? He might want to pack some stuff, my husband wishes he had taken some things for himself during my labour (hindsight is great! :s) such as a travel pillow, toothbrush and a change of clothes, we were up for 48 hours solid (i had a 40 hour labour) and he didn't have anything with him. He only went home after she was born because he wasn't allowed to stay overnight with us :( will Jofus be staying with u? As someone suggested itd good to take sth like vichy spray for face. also I'm packing disposable underwear... I know they look horrible but they allow your body to "breath". You may find that you need morethan one towel as they get dirty quickly. And most of all in hospital there are so many bugs that its better to take there things you can just throw away. I'm one week behind you but still didnt pack my bag :) but I may do it this week. I'm in my 39th week of pregnancy with my second. We are getting to the finish line! You may want to bring some black pants for recovery. There ends of being a LOT more blood than planned, especially if you tear or have hemorrhaging. It's more blood than you plan because your whole big uterus has to squeeze back down, and every friend of mine who has a baby wishes someone told them about the crazy bleeding beforehand. It goes by so quickly and becomes a faint memory before you know it. Also, bring some paper to write down Emilia's birth story! You forget the details so quickly, and it's wonderful to have it all written down to look back at or show your little girl someday. Good luck with your labor and delivery!! You will love having a girl! We are having our second, and we were so happy to hear that we were getting another girl. They're sooooo much fun.